I have been playing Irish, Scottish, and other folk music on the uilleann pipes (Irish bagpipes) since 1999, and have performed in a variety of venues in Ireland, the UK, and the US. I am a professional, conservatory-trained musician with a Master of Music degree from the Longy School of Music; I have also studied with some of the finest pipers in Ireland including Eamonn O Broithe, Mick O'Brien, Neillidh Mulligan, and Kevin Rowsome. My piping was recently featured on the soundtrack of the nationally-released film "Rooters: The Birth Of Red Sox Nation". I also sing and play Irish flute and tin whistle, as well as the bodhran (Irish drum). I'm always happy to take requests! Very Talented Musician! Thankful to have at our Wedding! We want to thank Daniel for doing an amazing job at our wedding. He is an absolute professional. We would recommend him to any event looking for Bagpipes. We especially appreciated his flexibility. Above any and all things you "plan for", there are always things that come up at events unexpectedly (Like one of the wedding rings getting left behind at the condo and just discovering it as you are ready to walk down the isle, just like in the movies... mountain roads being closed due to MUD, Etc Etc) and he handled such things very professionally. Thank you, Daniel, for making our day extra special! I haven't yet gone through wedding pictures but I will share when we received them from the photographer! Thanks so much, Rosemary--looking forward to seeing the pictures. It was a lovely wedding, in spite of mud and forgotten rings! Hope your band had fun playing at the reception. Having Daniel play at our wedding was an absolute delight. I contacted him about 2 weeks before the date with a last minute thought to surprise my husband for our wedding entrance. My husband is a Braveheart fanatic and was already having his groomsmen apply blue face paint before the reception to do a photo for a groomsmen Braveheart movie poster he was planning to put together for his gift to them. I contacted Daniel with a link to the Theme Song and he had no questions. Sent a contract, I sent it back, he showed up and played beautifully and was able to surprise everyone. Easy. It's the first thing my husband talks about when he tells people about our reception! Highly recommend. Daniel understands music. He also understands grief and respect. His quiet entrance to the back of the church to perform at my mother's funeral went unnoticed until he began playing. Tears streamed down many faces as his rendition of The Black Rose was near flawless and his deep emotional vulnerability to his music showed a vulnerability in keeping with the task at hand. He was courteous in scheduling his services and even though the roads were dangerous and the weather atrocious, her was prompt and flexible. THANK YOU Daniel!!!! We are Grateful God brought us to choose you! Thank you so much for the kind review, Ellen...I'm glad you thought that my music was a fitting tribute to your mother's life. I wish you and your family the best. 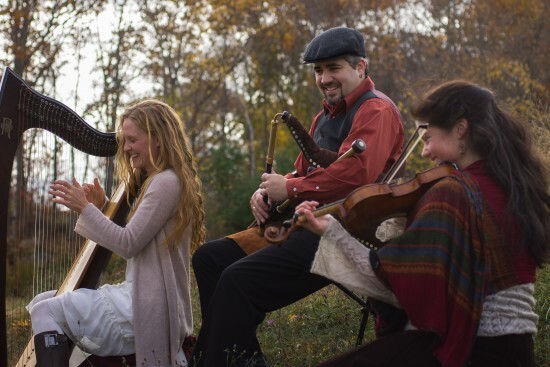 I am happy to play a wide variety of Celtic traditional music, as well as taking specific requests, if you have any. My repertoire also includes some Classical pieces and hymn tunes. Please contact me directly for more information! I have been playing the uilleann pipes (Irish bagpipes) since 1999, and have performed in a variety of venues in Ireland, the UK, and the US. I am a professional, conservatory-trained musician with a Master of Music degree from the Longy School of Music; I have also studied with some of the finest pipers in Ireland including Eamonn O Broithe, Mick O'Brien, Neillidh Mulligan, and Kevin Rowsome. My piping was recently featured on the soundtrack of the nationally-released film "Rooters: The Birth Of Red Sox Nation", and I have also played for a variety of theatrical productions. I specialize in traditional sean-nos ("old-style") airs on the pipes, and can play jigs, reels, and other Irish, Scottish and American tunes, as well as hymn tunes or special requests. I also sing and play Irish whistle ("tin whistle"), low whistle, flute and bodhran (the traditional Irish drum), and I'm happy to include these in my performance as well. If you're interested in a duo or trio, please contact me and I can probably accommodate you; other available instruments include guitar, fiddle, cello, and Celtic harp. The uilleann pipes aren't as loud as the Great Highland Bagpipes (Scottish bagpipes), and they have a wider musical range and a unique and beautiful sound. They can be played indoors as well as out, and are also suitable for playing with other instruments. Please contact me for a list of sample repertoire--I'm always happy to take requests!